A piece of public art is this week’s topic. You can find it on a flamboyantly styled building in the Midlands city of Leicester, UK. 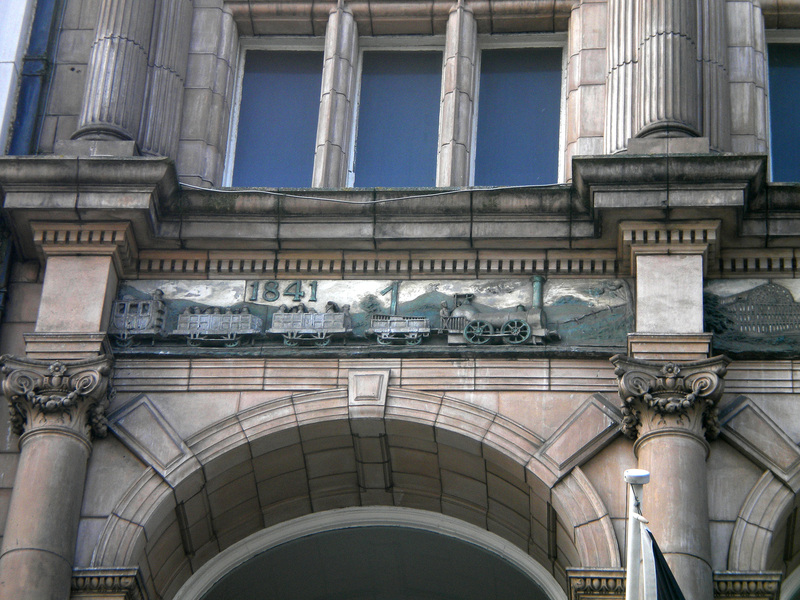 It’s a frieze illustrating three trains and a ship. Here it is. The frieze, the whole facade of the building in fact, commemorates local man Thomas Cook. He wasn’t local-born (he actually came from Melbourne in Derbyshire) but the memorial is there because Cook invented the charter-train business, and the travel agency as we understand it today, with a train from Leicester, and his company was based there in the early years of its life. He adopted the city (and vice versa) to the extent that he was buried there after his death. Cook’s story is fairly well known in Britain, though perhaps less so in other countries. In any case, it’s a great story, and it bears retelling. Although travel agencies aren’t really core to this blog, Cook’s firm had several other brushes with the British railway industry along the way, as well as developing a product that has gained treasured status amongst European rail travellers, the Thomas Cook European Timetable. Cook himself, born 1809, was a member of the temperance movement, which believed that many Victorian social problems could be traced back to the consumption of alcohol. Given the legendarily hard-working, hard-drinking, fast-living, quick-fisted lives of the railway navvies who were at the time carving the railways across the country, it’s not really a surprise. Walking to a temperance meeting in Leicester in 1841, from his home in Market Harborough, Cook hit on a wizard wheeze. He was impressed by the rapidly growing railway network (which hadn’t yet connected Leicester to Market Harborough, but which would do so by 1857) and wondered if this wonder of the age couldn’t be harnessed to provide a further marketing opportunity for the temperance movement. He suggested to the meeting that a special train could be hired from local railway and train operator the Midland Railway Company, to convey temperance supporters from Leicester to an upcoming meeting in Loughborough. It would be the world’s first ever arrangement of the sort, and the Midland Railway Company agreed. At a stroke, the charter-train business had been born. The train carried 500-odd passengers there and back, for a reduced fare (which Cook was able to negotiate on the basis of having block-booked an entire train), sold in advance by Cook himself to passengers. Essentially, that’s the business model charter train operators still use to this day, though modern charter fares are often higher than regular train fares, because much of the modern charter train business is built on offering luxury rail travel to popular sightseeing destinations or events. Cook’s initial venture was such a success that over the following years he followed it up with other charter trains carrying temperance society members and Sunday school children. Cook made no money personally on these trips, but by 1845, he was organising his first commercial charter train, which took people from the Midlands to Liverpool. As part of the offer, Cook provided a booklet covering items of interest on the journey; inventing the modern holiday brochure while he was at it. The organisers of London’s 1851 Great Exhibition at the Crystal Palace persuaded Cook to use his expertise to organise trains carrying workers from the Midlands and the North to London. Without the charter train business model of block-booking allowing Cook to negotiate cheap tickets, it is highly unlikely that such passengers would ever have been able to afford to travel to the Great Exhibition. Carrying 150,000 passengers on his trains, Cook was responsible to a considerable degree for the success of the Great Exhibition, and the wide geographical spread of its visitors. Cook eventually expanded into European trips, having to invent concepts such as coupons which could be used to pay for hotel accommodation rather than travellers needing to get hold of the local currency (which is worth remembering next time you print off a voucher from a late-booking hotel-finding website), and the “circular note”. This was the forerunner of the modern travellers cheque, allowing the holder to obtain local currency. As time went on, ownership of what had become Thos Cook & Son Ltd (Thomas Cook himself died in 1892) passed to Cook’s grandsons, until they sold it to the Belgian Wagons-Lits company in 1928. Wagons-Lits was the operator of various luxury sleeper trains across mainland Europe. In hindsight, this wasn’t perhaps the most propitious time for a British company to sell to a Belgian one, because just over a decade later, the Second World War began, and Belgium was invaded. The British government moved quickly to take control of the British assets of Thos Cook & Son Ltd, and transferred them to the four main British railway companies of the time. This wasn’t ideal either, as the railway companies had plenty of things to do already, given the war status in which they found themselves operating. Then again, travel agencies weren’t in great demand either, for exactly the same reason, so the extra work wasn’t all that onerous. After the war, Britain’s railways were nationalised, and so it was that Thomas Cook & Son became part of British Railways (with Wagons-Lits owning 25% of Thomas Cook’s overseas business) and the British government found itself with a state-owned travel agency. This slightly bizarre state of affairs lasted until as late as 1972, at which point Thomas Cook returned to the private sector, where it remains today. Thanks to its experience in mainland European rail travel, Thomas Cook (the company) also became famous for its Thomas Cook European Rail Timetable, which it published for 140 years, interrupted only by the second World War. The essential travel guide for international rail travellers within Europe, especially before the age of mobile internet access, the Thomas Cook European Rail Timetable was famous for including timetables which in some cases were more informative than those published by some countries’ own train operators. However, in 2013, a business decision by Thomas Cook to focus on core activities meant that it shut down its publishing arm, home of the Thomas Cook European Rail Timetable. It caused a bit of stir in the transport industry, and the publication was rescued by former members of the Thomas Cook European Rail Timetable team, who published the first edition of what is now simply the European Rail Timetable in 2014. Though it’s no longer published by Thomas Cook (the company), the European Rail Timetable remains a fitting memorial to Thomas Cook (the man) who basically invented railway tourism. 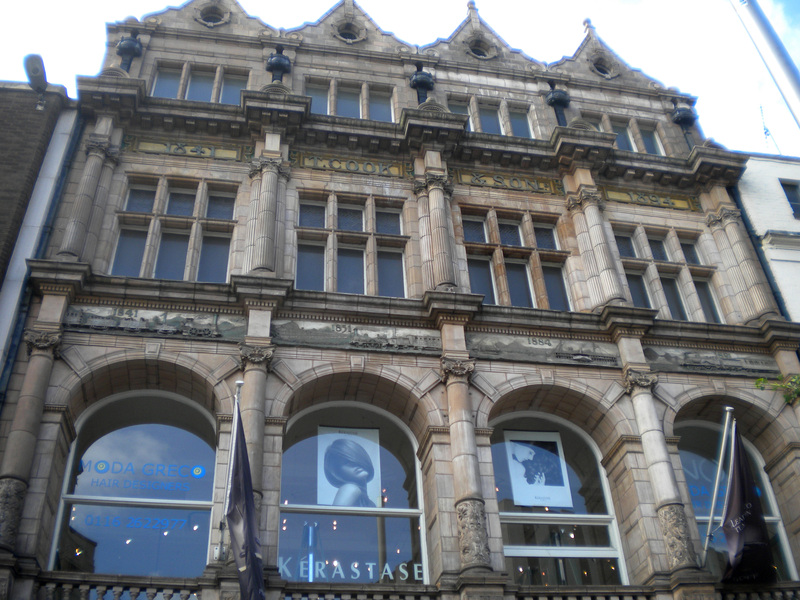 So too does the Thomas Cook Building in Leicester, which is where we came in. Rebuilt in 1894 to a design by architects Goddard and Paget with the facade seen in the photograph, it commemorates Cook’s early charter trains and his adventures by boat further afield. With its Ionic half-columns and Flemish gables up top, it’s an extraordinary confection, and a reminder that architecture in the Victorian period was more than just the Victorian Gothic many associate with it today. This is, appropriately, a more mainland European-looking building, albeit one which is as much a fanciful take on it as Victorian Gothic is on actual Gothic. Grade II listed in 1972 (the year Thomas Cook was denationalised) it’s a tribute to a fascinating piece of transport history, and the man behind it.